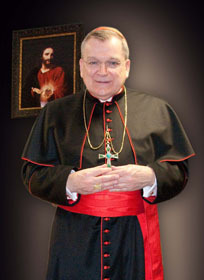 by His Eminence Raymond Leo Cardinal Burke D.D, J.C.D. Praying the Holy Rosary is integral to the spiritual practices of Marian Catechists. Already at the stage of pre-commitment, candidates for the Marian Catechist Apostolate are instructed to begin to pray daily five decades of the Rosary. The central place of the Rosary in the spiritual life of Marian Catechists is most understandable, for the purpose of the Marian Catechist Apostolate is twofold: first, the cultivation of a deep devotion to the Holy Eucharist and the Blessed Virgin Mary, and of a special loyalty to the Vicar of Christ, our Holy Father; and, second, the teaching of the Catholic faith, personally and through the communications media. (Marian Catechist Manual, pp. 1 and 7) Our Blessed Mother, the first and best disciple of Christ, Son of God and her Son, has one only desire: to lead us to Christ. She expressed so clearly and eloquently this desire at the Wedding Feast of Cana, when she instructed the wine stewards: “Do whatever he tells you” (John 2:5). It should come as no surprise that the late Father John A. Hardon, S.J., beloved and saintly founder of the Marian Catechist Apostolate, chose these words of our Blessed Mother as the motto for the Apostolate, for, if Marian Catechists are to bring Christ to others, they must first know, love and obey Christ in their lives. Because of the importance of the Rosary in the devotional life of the Church, our Holy Father has declared October 2002 to October 2003 the Year of the Rosary, in order to emphasize and promote the praying of the Rosary in homes and in the whole Church. For Marian Catechists, the Year of the Rosary is an invitation to deepen devotion to Mary, in order to carry out more fully and effectively the apostolate of catechesis. Contemplating the face of Christ through the praying of the Rosary, Marian Catechists are constantly preparing themselves to bring Christ to others. Our Holy Father also describes praying the Rosary as sitting at the School of Mary, for when we pray the Rosary, our Blessed Mother herself, as she always does, leads us to her Son. At the School of Mary, we come to know God’s immeasurable love for us in Christ. The method of the School of Mary is at once simple and profound. We pray repeatedly the Hail Mary, a most simple prayer, while contemplating the principal events in the life of Christ. The mysteries of the Rosary, in the words of Pope John Paul II, “put us in living communion with Jesus through — we might say — the heart of his Mother.” (No. 2a) The Hail Mary is a simple prayer which centers on the great mystery of the Redemptive Incarnation. Repeating the Hail Mary, while also concentrating our attention on the mysteries of the life of Christ and Mary, we ultimately enter more deeply into the mystery of God the Father’s love, sending God the Son in our human flesh, “conceived by the Holy Spirit and born of the Virgin Mary,” in order to free us from sin and everlasting death. In presenting the Holy Rosary anew to the Church and in commending the Rosary as a daily prayer, Pope John Paul II asks us to pray for two special intentions: peace in the world and the family. The Holy Father reminds us that the Third Christian Millennium began with the unspeakable terrorist attacks of September 11, 2001, and that terrorism, civil strife and warfare are found throughout the world. The Rosary is our means of looking upon Christ Who alone brings peace to the world. Recall how praying the Rosary spared God’s people at the Battle of Lepanto on October 7, 1571. Throughout the Second Christian Millennium, the Roman Pontiffs frequently urged the faithful to pray the Rosary for peace. Pope Leo XIII is an outstanding example. In fact, in declaring the Year of the Rosary, Pope John Paul II has also wanted to honor the 120th anniversary of Pope Leo XIII’s Encyclical Letter on the Rosary (Supremi Apostolatus Officio, published on September 1, 1883). For us as individuals, the contemplation of the Face of Christ leads naturally to the desire of reconciliation and peace. Christ, by His saving Passion and Death has broken down all walls which divide us, the walls thrown up by sin. Going, with Mary, to Christ, we find His peace and are enabled to bring His peace to others. 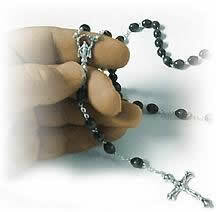 The Holy Father asks us to pray the Rosary especially for the intention of peace in the Holy Land. (Rosarium Virginis Mariae, No. 6a) At the present time, we must pray the Rosary also for peace in Iraq, the ancient Ur of the Chaldees where Abraham first encountered God. There is much more to write about the place of the Holy Rosary in the spiritual life of Marian Catechists, especially in the light of the Holy Father’s Apostolic Letter. For instance, the wonderful gift of five new mysteries, the Luminous Mysteries, merits extended attention. It is my intention to comment further on the Holy Rosary in the spiritual life of Marian Catechists in the next issue of The Tilma. In the meantime, I commend the reading and study of Rosarium Virginis Mariae to all Consecrated Marian Catechists and those who are preparing for consecration. O Virgin of Guadalupe, Star of the New Evangelization, lead us to Christ!